Keeping apples or avocados from browning after being cut is impossible; within minutes of being exposed to air, these fruits (yes, avocado is a fruit) begin to brown. No matter what you try—adding lemon juice, keeping the pits in place, immediately sealing the produce in an airtight bag—brown discoloration always occurs. However, air is not the only reason that foods like apples, avocados, and lettuce brown: it's also due to the knife you're using. Apples and other produce contain both polyphenol oxidase (PPO), an enzyme, and polyphenols, a chemical. Normally, these two are separated and do not interact in an intact fruit or vegetable. However, when the apple is cut or bruised, the damaged cells no longer separate PPO and polyphenols. They are also exposed to oxygen—which reacts with the enzyme and chemical to create the discoloration on the reactive surface. As for why the color of this reaction is brown, the phenol compounds contain iron—so the chemistry behind it is similar to rust. As I said before, it's impossible to stop fruits and vegetables from browning: we obviously can't stop these chemical reactions from taking place. Yet, to some extent, we can control the speed in which the reaction occurs... and it has to do with the knives you choose. According to Food-Info, iron and copper increase the browning rate of fruits and vegetables. And unfortunately, most stainless steel knives are composed of a mix of iron and copper (among other ingredients that include carbon and chromium, of course). 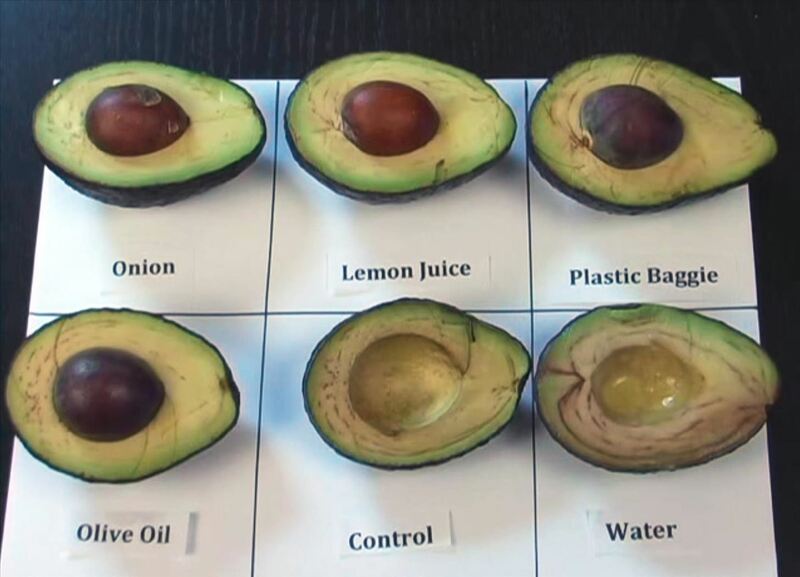 When you slice into an avocado or cut a head of lettuce with your knife, you expose the plant to both oxygen and the mix of metals I mentioned above. In other words, both your kitchen methods and tools are a perfect storm for browned fruits and vegetables. What Kind of Knives Work Best Then? Stainless steel knives shouldn't be forsaken completely, though: they're too useful in many other instances to even consider getting rid of them. Instead, save the metal knives for less sensitive foods while using a knife made of non-reactive material for your fast-browning fruits. 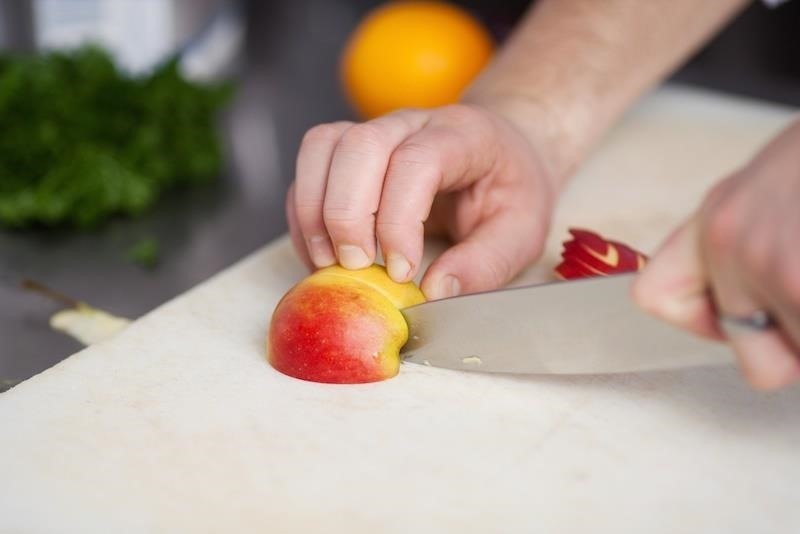 Ceramic knives are known for being chemically inert, which means they are perfect for cutting fruits and vegetables that are prone to browning. Plastic knives are non-reactive as well; currently, lettuce knives are marketed as preventing the browning process after cutting. Cook's Illustrated put this claim to the test by conducting an experiment. 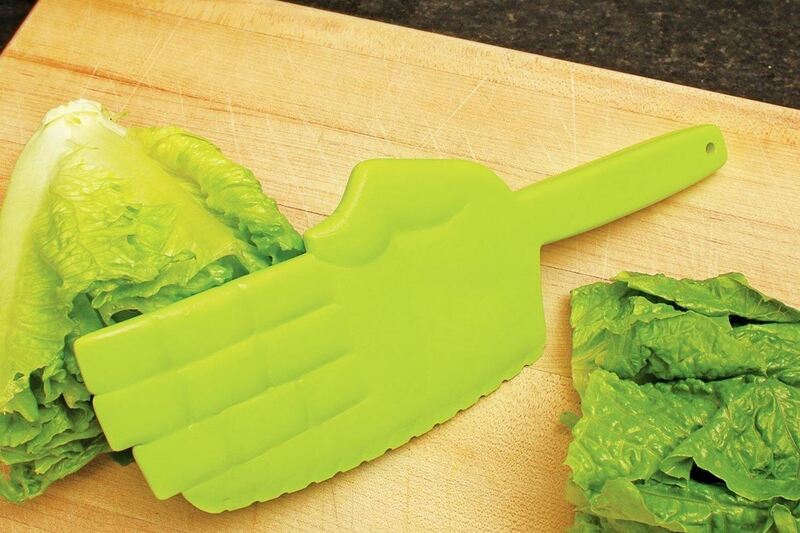 Three different cutting methods were used: lettuce was cut by a plastic knife, a stainless steel knife, and by hand. While tearing by hand seemed to be the best way to prevent premature browning, the plastic knife was able to prevent browning along its cut edges a day longer than stainless steel. My Ceramic Knives performed similar experiments on both apples and avocados, this time with a ceramic blade and a stainless steel blade. In both tests, the fruit cut with the ceramic blade slowed discoloration. In the end, both plastic and ceramic knives cannot prevent the rusting reaction permanently. However, being able to prolong the aesthetic appearance of produce without having to soak them in honey water or citrus, or sticking an onion next to them, warrants a second look at trying different kitchen equipment.